Psst! Here's a secret. You can still make Jell-O 1-2-3 at home even though they don't sell the boxed mix any more. I tried the one from Carolyn Wyman's book, "Jell-O: A Biography," and it was pretty spot-on! Loved this short-lived product. It was so cool to see the layers separate! One was like Jello, one like pudding, and one kinda like sweetened foam insulation, but we loved it. Just discovered The Metal Misfit's nostalgia blog, and he's got a fun post about Jell-O 1-2-3. 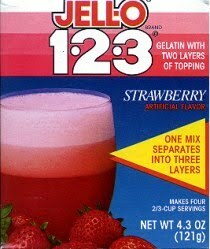 I loved Jello 1-2-3. My recollection of the product dates it back to the mid-1970s, not the 1980s. (you 80s kids are awfully unaware of the decade before you were born for some reason). I don't think we ever tried the orange or lime flavors, and my favorite was the raspberry flavor. I also remember the ad, with the names for all the layers: the foam, the sauce, and the jelly-jammy. I think that was our favorite part of the product.